The lone survivor of last summer’s rescue-helicopter crash at LaPush recalls the horror. PORT ANGELES — Coast Guard Lt. Lance Leone rescues people for a living. But he was alone, disoriented and bobbing in chilly waters off James Island the morning of July 7. Witnesses said the MH-60 Jayhawk rescue helicopter Leone was co-piloting had snagged thick power cables strung from LaPush to James Island across the mouth of the Quillayute River and tumbled into the water upside-down. Leone’s survival vest allowed him to breathe underwater after his helicopter crashed, he said last week by phone from Coast Guard Air Station Sitka in Alaska, where he is the base safety officer. But his right collarbone was broken “like a seat-belt injury,” his left arm and right leg were lacerated — and his three crewmates were nowhere in sight, he said in his first interview since the accident. Leone, 29, shot off a flare and was rescued within five to 10 minutes by Quileute Marina Harbormaster Darryl Penn and fisherman Charles Sampson, who pulled him into their motor skiff. “I couldn’t have swam,” Leone said. While the Ventura, Calif., man was recuperating at Harborview Medical Center in Seattle, he learned that his three fellow crew members had died. They included the pilot, Lt. Sean D. Krueger, 33, of Seymour, Conn., with whom Leone attended the Coast Guard Academy in 1998. Also killed were Petty Officer 1st Class Adam Hoke, 40, of Great Falls, Mont., and Aviation Maintenance Technician 2nd Class Brett M. Banks, 33, of Rock Spring, N.Y.
A week after the crash, a memorial service at Air Station Sitka was attended by more than 1,000 mourners. That’s where the crew members were based and where they were headed after refueling at Coast Guard Air Station Astoria in the final leg of a cross-country trip that began in North Carolina. The roughly 130-person base is accessible only by boat or aircraft. Townspeople and base personnel are raising money for a monument at the air station for the deceased crew members through the Coast Guard Foundation at www.coastguardfoundation.org. Leone, the father of a 3-year-old girl and a 1-year-old boy, spent five days recuperating, physically and emotionally. He was thankful the Coast Guard had his children and wife by his side “almost immediately,” he said. Leone’s son and daughter were blissfully oblivious to his injuries. The Coast Guard interviewed Leone for “several days” during his five-day stay at Harborview for its investigation into the crash, he said. Leone said he could not talk about the specifics of the crash, including why the helicopter was where it was when everything went wrong, while the investigation is ongoing. The three deaths were the only Coast Guard helicopter fatalities in 2010, spokesman Robert Lanier of 13th Coast Guard District Seattle said Friday. The district’s investigative report on the incident is being reviewed by Coast Guard headquarters in Washington, D.C., he said. It was one of three Coast Guard helicopter crashes in 2010, a number that generated a “safety stand down” ordered by Coast Guard Commandant Adm. Robert J. Papp. “He wanted to make sure we were sure of what the safety procedures were,” Lanier said. Lanier said the power lines that Leone’s helicopter hit have been removed. The James Island safety lights that the lines powered are now connected to an on-island generator. As for Leone, he said he’s fully recovered from his injuries. He’s been through six months of physical therapy for his bodily injuries and six months of mental-health counseling sessions for acute traumatic stress. “If you don’t deal with it while it’s recent, it becomes like a skeleton in the closet,” Leone said. “The Coast Guard has been excellent at rehabilitating me,” he added. “What helps get you through is family and friends. When you go home and hug your kids, that’s how you get through all this stuff”. At 2:23 p.m. on Friday, February 4, 2011, Sacramento Sheriff’s Deputies responded to a report of a helicopter crash near the levee on Sorento Road / W Elverta Road. Sheriffs Deputies located a helicopter that had crashed into a field. The helicopter was occupied by two people who sustained non-life threatening injuries as a result of the accident. The two occupants of the helicopter, who were performing construction on the towers at the time of the crash, were an adult male pilot and an adult female employee. Both were transported by emergency medical personnel for treatment. The Federal Aviation Administration and the National Transportation Safety Board will be investigating the cause of this accident. The Sacramento County Sheriff’s Department says both people aboard a construction helicopter survived when the chopper crashed in a field north of the capital city. The department says the male pilot and female passenger walked away from the crash reported at 2:23 p.m. Friday near Elverta. Both individuals were taken to a hospital with non-life threatening injuries. The helicopter was helping with construction of electrical towers in the rural area. No one on the ground was injured. Sheriff’s spokeswoman Sharon Chow says the Federal Aviation Administration and National Transportation Safety Board are investigating. Neither she nor the FAA immediately had the identities of those on board. No information has been released on what caused the crash. 2/1/2011 – DAVIS-MONTHAN AIR FORCE BASE, Ariz. (AFNS) — Air Force reservists from the 943rd Rescue Group responded to an Arizona Department of Public Safety helicopter crash in a rugged valley northwest of Tucson Jan. 31. Around noon, 943rd RQG Airmen were conducting two rescue helicopter training missions in the local area when they heard radio chatter indicating there had been an accident. “We are an Air Force rescue helicopter with a hoist. Do you need our help?” the aircraft commander asked. The 943rd RQG is an Air Force combat-search-and-rescue unit which trains to rescue downed or injured service members from combat situations. The distressed helicopter crew responded yes and, the Airmen immediately returned to Davis-Monthan AFB and picked up pararescuemen to assist with the rescue. Due to the rough terrain in the Avra valley, local rescuers had difficulty hiking to the accident. The PJs are highly-skilled personnel recovery specialists trained to perform rescues in all types of environments, to include mountain, cold-weather, water, etc. There were four people on board, two were able to escape, and two were trapped in the helicopter. “We were very concerned that our rotor wash would cause the wreckage to tumble down the cliff,” said Capt. Brough McDonald, HH-60G Pave Hawk helicopter pilot, 943rd RQG. The helicopter below was teetering so the aircrew put the helo’s main gear in contact with the ground while three pararescuemen jumped out and secured the wreckage with ropes. The PJs are also trained trauma specialist. In addition to getting to the victims in this hard-to-reach spot, they provided immediate medical aid. Two of the survivors were able to walk and could board the aircraft with some assistance, while the other two had to be hoisted with lifters. The survivors were transported to local medical facilities. On January 31, 2011, at approximately 11:30 a.m., The Pima County Sheriff’s Department helicopter crashed near Waterman Road and Silverbell Road. The three victims of the crash that were hospitalized are identified as Edwin Nettleton (58), Paul Panzica (41) and Larry Sayers (64). Edwin Nettleton and Paul Panzica were released from the hospital and Larry Sayers remains in serious condition. Mr. Nettleton is a consultant with AECOM, which is an architecture and building company. Mr. Panzica and Mr. Sayers are county employees with the Information Technology Department assigned to the PCWIN project. 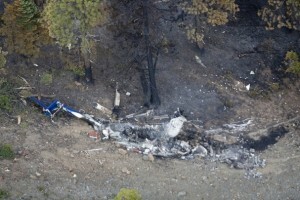 The helicopter crash will be investigated by the NTSB and the FAA. OTTAWA — The Canadian government has given up its fight to be shielded from a lawsuit filed by widows of a deadly helicopter crash — a move some say is a blow to Ottawa’s efforts to minimize its liability in cases involving possible negligence of government inspectors. Transport Canada confirmed Monday the government is not appealing a decision of the B.C. Supreme Court, which ruled in December that the department can be found liable, in certain circumstances, to the public when it exercises its regulatory powers in a negligent way. The Crown had argued that there was no cause of action against the government in this case because Ottawa cannot be sued for regulatory negligence in certain instances. The case involves Transport Canada’s relationship with the person who certified the helicopter as airworthy, despite an alleged checkered history as a maintenance engineer. Although the specifics of this case involve Transport Canada, the principle of regulatory negligence and the government’s duty of care can be applied to other departments charged with keeping the public safe by enforcing safety regulations. “It started off as minister of transport motion to strike the claim against them as a matter of law. Their position was the Supreme Court of Canada in a couple of cases had changed the ground rules as to when the government could be found liable in negligence,” Joe Fiorante, a partner at the Vancouver law firm Camp Fiorante Matthews, said in an interview Monday. The B.C. Supreme Court rejected the government’s “insufficient proximity” as part of its argument to minimize its regulatory exposure. “The negligence alleged against Transport Canada is with respect to something over which it had direct control: the designation of maintenance personnel and organizations who are authorized to perform work on and certify aircraft,” concluded B.C. Supreme Court Judge E.M. Myers. The trial, set to proceed in May, will now proceed with the federal government as a defendant alongside Art Comeault, who repaired the helicopter and certified it as airworthy. “Typically, the regulator is going to want to limit its liability. In making arguments like this, it’s going to rely on cases that support that end result. I guess I’m not surprised,” said Carlos Martins, a partner at the Toronto-based law firm of Bersenas Jacobsen Chouest Thomson Blackburn and a specialist in aviation regulations. Transport Canada declined to comment on the case, saying it would be inappropriate for it to comment on legal action that the department is currently engaged in. The case involves the circumstances that led to a deadly helicopter crash in Duncan, B.C., on Sept. 17, 2005. Robert Honour, 51, had purchased the helicopter a few months before the crash, and he was piloting the aircraft at the time of the crash. Les Chadwick, 29, who was his sole passenger at the time of the crash, also died. Comeault, who was designated as an approved maintenance engineer by Transport Canada under the Canadian Aviation Regulations, repaired and certified the helicopter as airworthy through his company, A & L Aircraft Maintenance — also certified and licensed as an Approved Maintenance Organization. The widows of the two deceased allege that the department owed a duty of care to remove Comeault from the position of a certified person responsible for maintenance — given Comeault’s prior conviction for offences under the Aeronautics Act involving making false entries in a journal log with an intent to mislead. The regulations prohibit anyone with his prior conviction from acting as a person responsible for maintenance. An earlier Transport Canada audit of A & L also found that the company was maintaining aircraft that were not in compliance with policy manuals and other required practices, the lawsuit alleges. The Transportation Safety Board, which investigated the crash, has already determined that the helicopter was not serviced or maintained in accordance with existing regulations and, as a result, maintenance actions to correct serious engine-driven fuel pump defects were not completed. The “2010 Antarctica Helicopter Crash” occurred on the 28 October, 2010 approximately 100 km from the French research base Dumont d’Urville Station. All 4 aboard the chopper (1 pilot, 3 passengers) were killed. The Eurocopter AS350 had taken off from the French research ship L’Astrolabe approximately 370 kilometers north-east of the Dumont d’Urville Research Station, however contact was lost, and a distress beacon was activated later that day, triggering a rescue response including the Royal Australian Air Force and American personnel out of nearby McMurdo Station. Bad weather hampered rescue efforts but a RAAF C-130 Hercules spotted the crash site with at least 3 bodies seen at the scene on the Friday. A French helicopter with a doctor on-board from Dumont d’Urville touched down soon later, and confirmed all 4 on board were deceased. This was later confirmed by the AMSA. Wind probably caused difficulties for a helicopter piloted by the former world rally champion Colin McRae that crashed killing all four people on board, an inquiry heard. The crash killed McRae, 39, his five-year-old son Johnny, the boy’s six-year-old school friend Ben Porcelli and a family friend, Graeme Duncan, 37. The aircraft came down near McRae’s home in Lanark as he flew home from a trip to see a friend. Several witnesses spoke of an unusual noise from the helicopter. Robert Muncie, 54, said it had been making a “clunking” noise like the sound of bricks in a cement mixer. And Anne Cooper, 57, said it was making a noise like coins in a washing machine. The inquiry will resume on 24 January. The state of Maryland has filed a $4 million lawsuit against the federal government over the 2008 crash of a state police helicopter that killed four people. The state claims in the lawsuit that two air traffic controllers failed to respond adequately to the pilot’s distress and contributed to the crash. The lawsuit accuses the controllers of negligence, saying they didn’t provide adequate weather information, didn’t help the pilot with his approach in heavy fog and were distracted by less important matters. The controllers are employed by the Federal Aviation Administration. Attorneys for Jordan Wells, the sole survivor of the crash, filed a similar lawsuit last month that seeks $50 million in damages. The National Transportation Safety Board concluded that a combination of factors caused the crash. An Oregon helicopter company blamed by federal investigators for a 2008 crash that killed nine people in the north state responded Wednesday with a letter saying the National Transportation Board botched the investigation. The NTSB last month finalized a report that said the company falsified documents detailing the helicopter’s weight, causing its pilot to miscalculate his load and crash. The helicopter crashed Aug. 5, 2008, just after picking up a fire crew from the remote Iron 44 helipad in the Trinity Alps on the Iron Complex of fires. The fiery crash killed seven contract firefighters onboard, a pilot from Redding there to oversee the flight crew and the pilot. The co-pilot and three firefighters survived. The helicopter crash was the deadliest in the history of the U.S. Forest Service. “This accident was about an aircraft that was well over its weight limit,” Deborah Hersman, NTSB chairwoman said at the Dec. 7 hearing in Washington, D.C.
At the hearing the NTSB said Carson Helicopters falsified the documents in an effort to win firefighting contracts with the Forest Service. That day Carson Helicopters responded with a brief statement saying one manager falsified one of 36 performance charts for the helicopter and that fuel system problems were the cause of the crash, not the helicopter’s weight. Franklin Carson expanded that argument Wednesday in a six-page letter to the NTSB. He said the company spent more than $4 million to modify and test the Sikorsky S-61, which originally was designed to be a submarine chaser. In the conversion of the 1965 Sikorsky helicopter to the “Fire King,” the company added a 900-gallon underbelly water tank and seats for 15 passengers. In the letter, Franklin Carson said his company notified Sikorsky; General Electric, which built its engines; and Columbia Helicopters of Portland, Ore., which overhauled its fuel controls, that problems with a fuel filter were causing engines to lose power. But the issue wasn’t addressed until after the crash, he wrote. Spokesmen for Sikorsky and Columbia Helicopters declined to comment on Carson’s allegations. The companies, along with General Electric, are involved in ongoing lawsuits resulting from the crash. Franklin Carson said the NTSB ignored testimony from the helicopter’s co-pilot and a history of fuel system problems with the S-61 that point to an ineffective fuel filter as the cause of the crash. He says that the NTSB was driven to put blame on his company after losing fuel system parts collected at the site and declining invitations to participate in Carson-organized flight tests of the same helicopter model. Franklin Carson said the tests show the helicopter could have handled the load it hauled when it crashed had its engines functioned properly. Bridget Serchak, spokeswoman for the NTSB, declined to comment on the Carson letter other than to say that the NTSB put its full 175-page report about the crash onto its website, along with supporting documents. “These materials together represent the sum of NTSB’s response and position on this investigation,” Serchak wrote in an e-mail Wednesday.